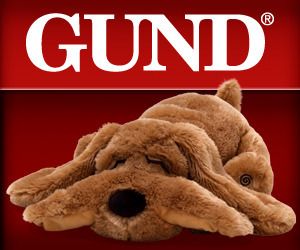 I remember GUND from when I was little! Gund has been around, creating high quality stuffed toys for over 100 years. Now, the first ever GUND “Top Dog” Contest is in progress with a grand prize of “the Boo treatment” - a limited edition GUND plush in the winning pup’s likeness! This is inspired by the popular "World's Cutest Dog" Boo stuffed dog from GUND. Simultaneously with the “Top Dog” Contest on Facebook,GUND will run the “Most Pinteresting Dog” Contest on Pinterest. Entrants will be asked to post their entry on their own pages, “tag” @GUNDMostPinterestingDog and submit the link to GUND at MostPinterestingDog@GUND.com. The “Most Pinteresting Dog” Contest winner will be selected based on the number of times the entry is “liked” on the GUNDPinterest board and the winner will receive a selection of GUND products valued at $250 retail. For complete rules, see “Top Dog” Contest and “Most Pinteresting Dog” Contest rules at www.GUND.com. If you enter, come back here and share :) I may even enter our dog whom I think is pretty darn cute! Good Luck to All! Disclosure: I received a plush Gund as a thank you for sharing this information with my readers. HP, Walmart and Back-To-School - Giveaway! Amazing World and Zings - tweet to win! "May Is For Moms" Winners!